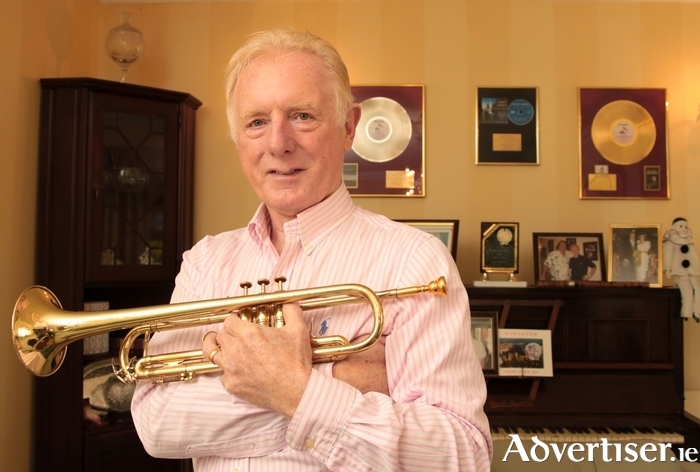 On Thursday September 21, the Salthill Hotel will host a showband equivalent of The Last Waltz when some of the biggest names in the business gather for a tribute concert in honour of trumpeter Johnny Carroll, who this year celebrates his 60th year as a performing artist. Carroll was born in Castlerea, County Roscommon, in 1943, the eldest of five children. His father, Joe, was a painter at the local hospital and had a love of brass bands, while his mother, Rose, had a musical background and played the fiddle. Still spry at 73, Johnny met with me one morning last week in the Clybaun Hotel to reflect on his long career and began by recounting how he first got into playing music. "A brass band started in Castlerea in 1955," he says. "At that time in Castlerea there was no social life, so the first night the band started about 150 guys showed up looking for instruments. I went down and was sent home; I went down for seven or eight weeks and was sent home every night because there was no space for me, and when the practising started I had to leave. Johnny was a mere stripling of 13 when he started his showband career with The Premier Aces. “The Aces started in Ballintubber and they heard me practising one evening as they were passing the house," says Johnny. "I had a trumpet my dad had bought me on HP from Waltons in Dublin. A month later there was a knock at our door and it was their bandleader Paddy Malone and he asked my parents would they mind if I joined the band. "At first they said ‘No way’. Paddy asked them to think about it and he’d come back in a few weeks. When he did they were still reluctant, but the fact that all the lads in the Premier Aces were pioneers persuaded them to give it a try and they said I could go for the summer. The band were only playing one or two nights a week at that stage. "I started playing with them in 1957 and we soon became very popular and rapidly went to playing three or four nights a week. We played the pop songs of the day, Cliff Richard, Elvis Presley, stuff like that. My first night with them I was paid thirty shillings, which was good money – my father was earning £3 a week at the time. From the first time I went on the road I really enjoyed it. It was hard but I didn’t mind. In 1960, the Premier Aces made their first foray to England; “At that time there were no dances in Ireland during Lent – the Church didn’t allow it,” Johnny explains. “All the bands went to England for those seven weeks. We’d do a dance in Castlerea on Shrove Tuesday and we’d drive to Dublin on Ash Wednesday and our van would be lifted onto the boat by crane. After leaving the Premier Aces, Johnny spent four years with country outfit, The Swallows, and another seven with the Magic Band before striking out on his own in the early 1980s, going on to release 15 best-selling albums of easy listening music. “I met marvellous people," he reflects. "I worked with the likes of Johnny Cash and Roy Orbison. I met Andy Williams and had the privilege of meeting and working with Glen Campbell. I was doing a concert in Cleveland in the mid-90s. After the show a lady came up to me and introduced herself as Sandy Gillart, Glen’s official photographer. While Johnny’s life has had many highs it has also had painful lows. His first wife, Stella, died of breast cancer in 1986, aged only 37, leaving Johnny to raise their four children aged from seven to 13. His children now all have families of their own and Johnny proudly mentions that his seventh grandchild arrived a week previously. He also found happiness with his second wife Anne who he met eight years after Stella’s passing. He reflects on his music career with pride. The tribute concert to Johnny Carroll takes place in the Salthill Hotel next Thursday September 21 at 8pm. Featured acts are Jimmy Buckley, John Hoban, Mick Flavin, Matthew O’Donnell, The Conquerors, Brendan Shine, Tony Allen, Trudi Lawlor, PJ Murphy and Eddie Carey. Tickets are €25, available from Salthill Hotel, Jaycee, Salthill Post Office and Des Kavanagh Electrical. MCs for the night are Jimmy Higgins from Galway Bay FM and Chris Carroll from Mid West Radio. Raffle proceeds go the Galway Hospice.